What causes knee instability or patellar dislocation and what does realignment involve? At some point in their lives, most people will experience some kind of knee pain or discomfort associated with movement and activity. This is because, like most things, joints get worn out with regular use, and it’s pretty difficult to avoid the use of major joints like the knees. The cause of knee pain varies, from conditions such as osteoarthritis that develop slowly over time to ligament injuries that can occur in a split second, but they all have one thing in common: they can severely disable a person, impacting their ability to carry out day-to-day activities, sports and exercise, and generally disrupting their enjoyment of life. Each year in Australia it is estimated that there are 676,000 knee injuries, and more than 30,000 knee replacement surgeries performed. The prevalence of knee pain and injury increases with age and women, interestingly, suffer from more knee pain and resulting disability than men (nearly two-thirds of knee replacement surgery recipients are women). Injuries commonly occur when you do something new or strenuous, such as lifting heavy items or playing a new sport. 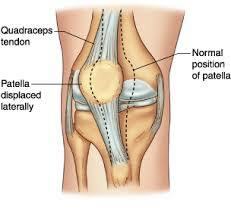 One common knee injury is dislocation of the patella. The patella is commonly referred to as the kneecap and is responsible for connecting the muscles at the front of the thigh to the tibia. The patella usually sits in the femoral groove (the Trochlear) at the end of the femur, unless dislocated. Dislocation of the patella can be caused by an uneven or shallow femoral groove (this is known as Trochlear Dysplasia). Normally, the groove is deep enough the once engaged, it is difficult to dislocate the patella, but in people with Trochlear Dysplasia, the groove is too shallow, leaving them vulnerable to patellar dislocation, particularly when the knee is flexed at a certain angle (for example, when running). This vulnerability can also be caused when the patella sits too high and does not properly engage with the trochlear groove. This is known as Patella Alta, and can exist simultaneously with Trochlear Dysplasia. People with both conditions are at a high risk of recurrent dislocation of the patella. Sometimes the structure of the knee and leg tendons and muscles can increase the likelihood of patellar dislocation, as well as a direct, hard blow to the knee(such as falling onto the kneecap) can cause it to slip out of place, resulting in a partial or complete dislocation (this can happen to anyone). While some knee injuries can be more difficult to realise, if you dislocate your patella, you’ll know it. Strong pain (especially in the front of the knee, and increasing with attempted movement), inability to weight-bear, stiffness, cracking / creaking during movement, swelling, loss of movement, instability, and the kneecap slipping to the side are all common symptoms of a patellar injury. Patellar problems can usually be diagnosed easily through physical examination, while imaging tests such as x rays may be ordered so the doctor can see how the patella fits into the femoral groove. Other potential problems such as cartilage damage or ligament injuries will need to be ruled out. In the case of patellar dislocation, the patella may pop back into place on its own; however the doctor may need to apply gentle pressure to push it back into place. This procedure is called a reduction. Sometimes patellar dislocation can cause damage to the bones, leading to pain and arthritis and necessitating arthroscopic surgery to resolve the issue. Special exercises designed to strengthen the thigh muscles, along with using a brace may be recommended for partial dislocation injuries. If the kneecap continues to dislocate, surgery to tighten the tendons or release too-tight tissues can be performed to help keep it in place. A history of patellar dislocation can lead to knee instability, where there is a feeling that the knee may buckle or slip out, particularly when moving from a sitting to standing position. Where conservative treatments don’t work, patella realignment surgery may be considered. What is patella realignment surgery? This surgery aims to return the patella to a normal tracking path by realigning the patella in the trochlear groove and decreasing the Q angle. The Q angle is a measurement of the angle between the quadriceps muscles and the patella tendon which can affect the alignment of the joint and lead to instability and dislocation when too wide. There are several surgical procedures for patellar realignment depending on the cause of the instability. During a proximal realignment procedure, the structures that limit the movements on the outside of the patella are lengthened or ligaments on the inside of the patella are shortened. This procedure decreases the Q angle by moving the tibial tubercle towards the inner side of the knee. Surgery can be performed under spinal or general anaesthesia. The surgeon will first use an arthroscopic procedure (using small incisions and instruments / camera) to determine the extent of damage and procedure that is required. After evaluation, the surgeon will make a larger incision across the front of the knee to repair any anomaly. A lateral retinacula release may be performed, where the tight ligaments on the outer side of the knee are released to allow the patella to engage properly in the femoral groove. Your surgeon may also tighten the tendons on the inside (medial) of the knee to realign the quadriceps. In some severe cases, a tibial tubercle ostomy (TTO) may be required. This is a much more invasive procedure where a section of bone where the patellar tendon attaches to the tibia is removed. This bony section is then shifted, realigned with the patella and reattached to the tibia using screws. Medial patellofemoral ligament reconstruction (MPLR) is becoming a popular choice for patients with severe patellar instability. The medial patellofemoral ligament is the main ligament responsible for stabilising the patella and preventing partial or full dislocation. Where dislocation has occurred, the ligament can be ruptured or damaged, leading to instability. The surgery involves making a new ligament to replace the damaged one, usually using one of the hamstring tendons. Around 20cm of the healthy tendon is removed and grafted in place of the damaged ligament via small incisions. The ligament runs from the front inner edge of the patella to the inner edge of the femur, and is fixed with plastic screws or sutures placed in to small drilled holes. After repair, the incisions are closed with sutures. As with any surgery, patellar realignment and MPLR carries risks such as infection and nerve damage. Your surgeon will guide your postoperative care with appropriate pain relief and rehabilitation plans.